Tasking you as the lone driver of a landtrain, Far: Lone Sails has players sailing through the bed of a giant, dried-up ocean in search of an ancient seafaring civilization that once sailed these seas. Rather than fighting monsters, this journey is a lonely one, with train drivers look for any remnants of this once vibrant people. If your looking for more indie offerings, check out these top notch PC indie games. Far: Lone Sails is a proper road trip, with the main challenge being maintaining your faithful rust bucket as you continue your long journey. You are constantly torn between two states of mind: calm as you watch flat plains and grey skies stretch on forever and then panic as your engine bursts into flame and you have to extinguish the fire. The game’s colour palette is suitably muted, with there only being occasional flecks of red and blue to point out specific objects in the mass of grey. Your landtrain is fully upgradable and customisable, so rummaging around any wrecks you find to fix up your engine or increase your fuel tank will be your main break from driving. As the game’s title suggests, you can fix a sail to the top of your vehicle, helping to push you along in the good weather. You’ll no doubt have to upgrade your landtrain to cope with certain weather conditions, or you’ll instead have to spend a lot of time putting out fires and patch up your hull. 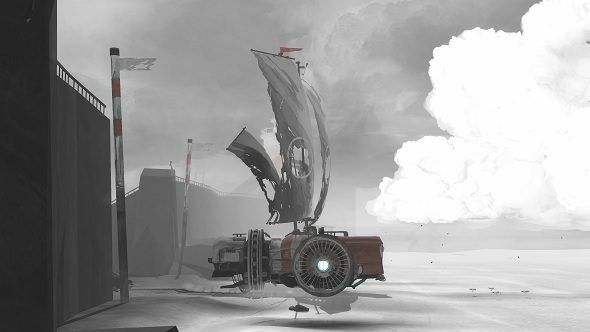 Far: Lone Sails certainly looks intriguing with its minimalist art style and occasionally panicked vehicle maintenance but it could be a while before we hit the open road. It will be playable at GDC in March so expect more news on this solitary adventure next month.